← My Addiction: Time Management… Games! One week into ROW80 2012, Round 1, and I’m already learning! Last week, Kait Nolan posted about the concept of a test mile on the ROW80 blog, and how it can apply to goal setting. Toward the end of the last round, I’d gotten my revision down to the type-in stage, which is when all the changes are marked in the printed manuscript, and all I have left to do is type in the changes. Sounds easy, right? The timing of the “test mile” blog was funny, because I’d just figured out the week before how much I could do on a type-in in one hour: ten pages. That doesn’t sound like much, until you see that while many of those pages look like the one on the left, a fair number of them look like the one on the right. But what was really great, was I found something else that helped: Breaking a task down into manageable chunks, AND planning the work for each day. I read this on someone else’s blog to plan the work for each day, and sadly, I don’t remember where (if you know, please comment so I can link to them!). From my time management studies earlier this year, I know that I have about an hour to spend each evening on actual writing tasks (writing and revision, as opposed to promo, commenting on blogs and responding to comments on my blog, social media networking, cover art, reading for contests, etc.) I also estimated that I should be able to spend 3-5 hours on Saturday, since I didn’t have much else going on besides putting away the Christmas stuff (done – yay!). So I broke out five segments of approximately 10 pages each (1-3 scenes), and paperclipped them. That left only 20 pages for my Saturday work. Perfect! I could have fit in more, so left that extra time for reading for a contest, writing this blog a day early, and maybe doing a test mile for my next task: reading my book aloud. This is an important part of my revision process; it’s where I make sure everything reads smoothly, the characters’ thoughts and dialogue are appropriate for who they are and their situation, typos, and making sure I stay true to my writing voice. After that it’ll go to the beta readers. One thing I see a lot of other ROW80 participants doing that I haven’t is to add in other goals, especially ones relating to social media and blogging, fitness, and decluttering. So I’ll jump in there, too, and maybe share a bit more about what’s worked for me on those fronts in future updates. Whether or not you’re a writer, did you set goals this week, and if so, how did you do? This entry was posted in Blog, ROW80 and tagged author, goals, Jennette Marie Powell, paranormal romance, ROW80, time management, time travel, Time's Fugitive, writer. Hey there, great post. Woman you are inspiring. I just set out a few long range goals then fly at it. Hmmm, perhaps a more measured approach is in order…. naw, not my style. So glad it works for you. My edits tend to look at lot like the one on the right. Every time I get to the edits stage I cringe because I know it’s going to be bad. But breaking them down into small chunks works great and doesn’t make you feel (as) overwhelmed. 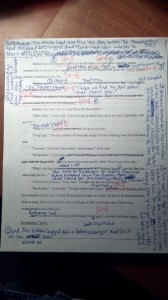 Post edits, I tend to read everything out loud as well (normally I use the computer to read it to me because I can easily add fake flow to the words when it isn’t there). Glad I’m not the only one with that quirk 😉 Great job this week. I like your clear, specific goals. I have no doubt you’re going to be even more productive going forward. 1. Finish first draft of Book #4. I wanted to get this done in 2011, but I was two days over. But I did it. That’s all that matters!! 2. Get the Christmas decorations put away. And I succeeded! (Finished today). You have LOTS of goals. But then, you have lots of things going on. All I plan on doing this week is critiquing my partner’s book. It’s taking me longer than I thought, so I have no idea when I’ll finish. I won’t even think about starting a new book until I get that job done. The break will be good (and critiquing is helping me spot errors in my own work). Don’t know if I can get into all that time management stuff you love. I guess I can only do what works for me! Good luck in reaching your goals! Stacy – LOL, glad it wasn’t only me, just now getting around to putting the Christmas stuff away! And congrats again on finishing your draft! We all have to split up tasks in the way that works for us. I constantly experiment! Fabio and Ryan, thanks, and good luck with your goals, too! I’m also thinking about including exercise to my goals … after all, everyone needs exercise, right? It’s interesting, seeing how others work through their writing and revision. We learn so much and are able to improve our own methods. Thanks for sharing! Catherine Hershberger, writing as C.D. Hersh and Catherine Castle. (Sheesh, keeping these personnas straight might be the death of me. Catherine, ROW80 is a great goal-setting and motivational tool! What’s really nice is we can set whatever goals we want. It’s not focused on new words only, like many challenges, and you can set however much you want. Good luck, especially with the pen name stuff! Juliana – we’ll see how my exercise goals go! Good luck with yours, and thanks for your comment! See, I have to pay more attention to your ROW80 posts. They’re more real, broken down into bite size pieces. Attainable. And so encouraging! Well, I’m a newbie to the ROW. But the good news is I posted on the right day this time! But I forgot the insignia. Duh. Oh well. Next time. LOL Karen! There are no ROW80 police to come after you – post it when you want, if you want – and good luck on your goals! Wow, that’s awesome! I love the structure and organization you’ve achieved. Very inspirational! I set goals, and added some steps to accomplish them, but I think I will read about that test mile. Sounds interesting. I like reading ROW 80 posts–very inspiring! Thanks, Heather, Coleen, and Callene! It helped me so much to figure how much I could do, then allot that for each day. Good luck with your goals! I like how you’re always thinking through what works for you and tweaking your plans. We should all learn and adjust when needed. I did okay on some goals, not as well on others. It was a decent start for ROW80 for me. Have a great week! 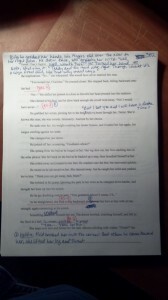 Alberta, what’s scary is that those are my edits – the ones that get done before anyone reads! But, my copy editor (who also does a little developmental editing) usually has very few changes to suggest. I have to print it out to re-read and mark up, too! Julie, one of the things I love about challenges like this is that they teach us what we’re really capable of – and in the last round’s case, what’s not reasonable given the rest of our lives. Some success is better than none – good luck this week! The right side revision paper looks an awful lot like mine, too, which is why I consider my second draft more of a rewrite than a revision! I love your organization with all your revisions, too; very cool. I love all the little systems we writers seem to devise to get our creative processes in order! Looks like you’ve got a lot of really great goals and a really great way to approach them, too! Keep it up! Thanks, L.S.! I use Holly Lisle’s “How to Revise Your Novel” system, which is brutal but really takes my writing to the next level! Good luck with your goals! LOL Karen – we keep our grill in the garage, so we use it year ’round! But it’s nice to not have to go outside a lot, this time of year. Thanks for stopping by!